A 1999 in Excellent Condition!! own unique sound with the USA made DeArmond Pickups! It plays and sounds fantastic!!! You wouldn't believe it till you try it! Since these guitars have been discontinued since 2000, they are becoming very collectable!! 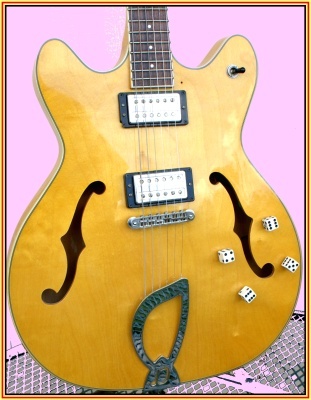 This Starfire Custom is very special and VERY collectable in this condition!! These guitars were discontinued in early 2000 because they were so good they were cutting into Guild's sales because of their price and quality!! After Fender purchased Guild in the mid '90s, reissues of some Guild electric guitars were manufactured in Korea under the DeArmond brand name, which Fender also owned the rights to. Import reissue models included the Starfire, X155, T400, M-75 Bluesbird, S-73, and Pilot Bass series. On the front of the headstock, these instruments display the DeArmond logo above a modified version of Guild's Chesterfield logo. As is being discovered, and may not be widely known, Korean guitars are on par with Japan in every way! The photos do not do this beauty justice! If you see it here ... It's Available! and we can set up an appointment for you to come by and pick it up!